Gren Bartley is a widely praised and accomplished musician. Over the past few years he has honed his musical craft. 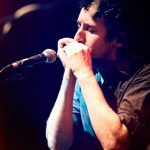 He’s toured the length and breadth of the UK and much of Europe, writing & recording several albums worth of new material and working with respected & talented musicians and producers. The results of Gren’s work are really worth hearing live or on his many studio recordings. Gren has released ‘Quiet’, a new download- album of songs and guitar. Listeners can download the album for free, but you can also contribute by donating any amount. Magnificent Creatures is Gren’s first full band based album. In 2015 Gren toured the album to fantatastic live receptions across the UK and Europe, building upon the success of Gren’s previous solo albums, Winter Fires (2013) & Songs To Scythe Back The Overgrown (2012). The album reflects a significant change in his musical direction, and incorporates intricate string arrangements and subtle vocal harmonies. Gren’s live work captures his “phenomenal” guitar playing & poetry driven lyrics, backed up by beautiful vocal harmonies and string arrangements from band members Kath Ord & Sarah Smout. The drive of the music and the orchestral flourishes sweep the audience into the narratives and subtly embellish the songs. However, never one to stand still for long, Gren soon embarked on a new music project and the new material will be available on line in late 2018. Sign up for the mailing list using the form below and we will send you updates when we’re touring or when new music is due.